Each Saturday in the second quarter of 2018 (April-June) I’m showing projects based on scraps in hopes of motivating you to cut and use your scrappy stash. Today I have a treat for you – more than one project – and they come with a back story. 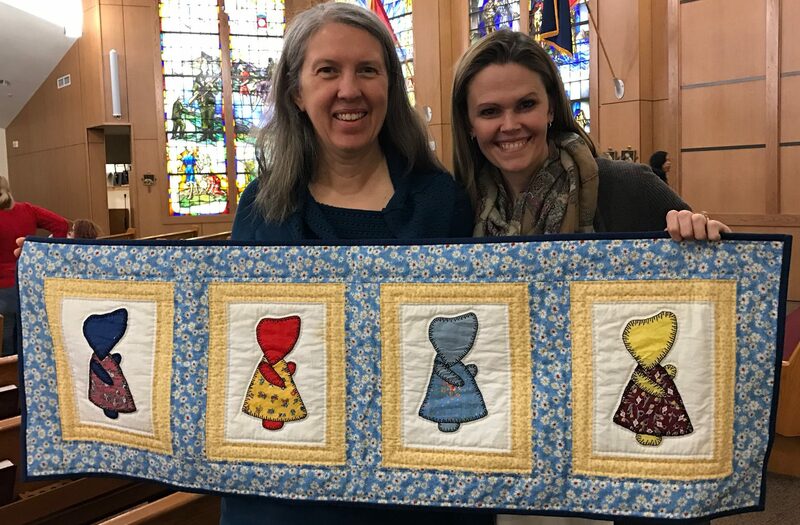 Kay, a member of my church’s quilt group, served as power of attorney for an elderly woman, Evelyn Sexton, for nearly a decade. Evelyn, a native of Lillington, NC, devoted her life to looking after her farming family. At some point early in her life, an infectious fever devastated her family. Some family members died, and her father was left blind. Evelyn was the only one of her family not affected. Kay described Evelyn’s home as simply furnished with the antiques she collected. And it was evident that quilt making was a joy and passion. When Evelyn passed away, Kay had a hand in distributing quilts to cousins and other family members. Kay, herself, took home a box of fabric. Fast forward ten years. Kay was recently cleaning out a storage area when she came across the box from Evelyn’s estate. Opening it, she saw a layer of polyester fabric – not what Kay wants to sew with. On her way to the garbage can, she decided to look through the box. 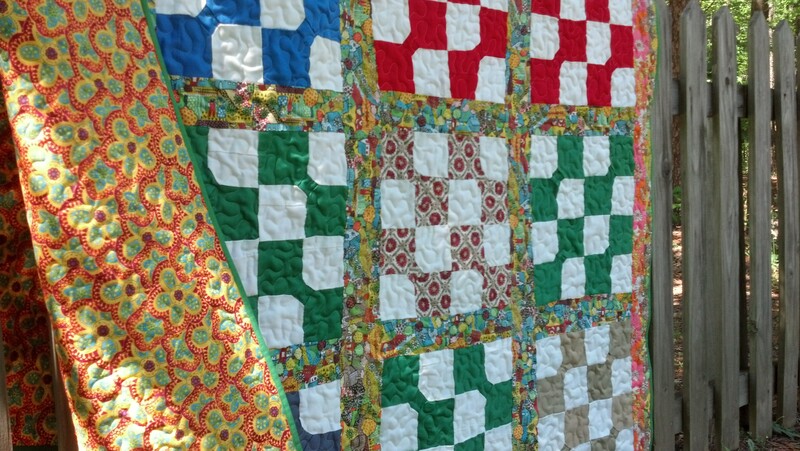 She found a “Log Cabin” quilt pieced and quilted by hand and also blocks to make another! Isn’t this scrap-alicious? Kay also found a stack of totally scrappy “Eight Point Stars.” The Stars had been starched and stuck to blue and pink background squares. Kay gently “unglued” them and washed them by hand. She machine stitched them to yellow background squares with a tiny blanket stitch and plans to use a black floral print found in Evelyn’s box as sashing. “Trip Around the World” is yet another scrappy project Kay found folded in the box along with several different patchwork squares, all pieced by hand. 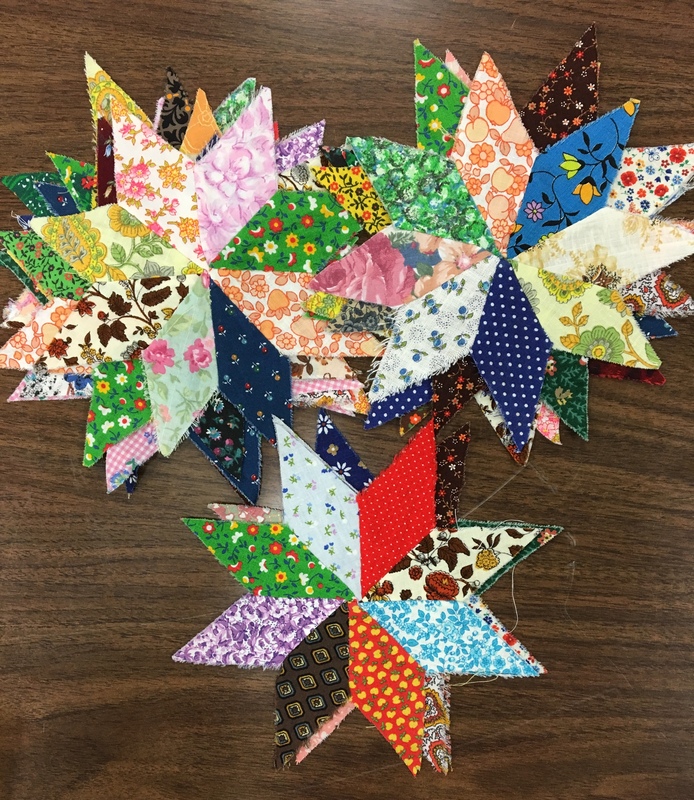 These projects, made with “just scraps,” are now precious to Kay because of the friendship she shared with Evelyn. The quilts are a sweet and cheerful reminder of the times they spent together. 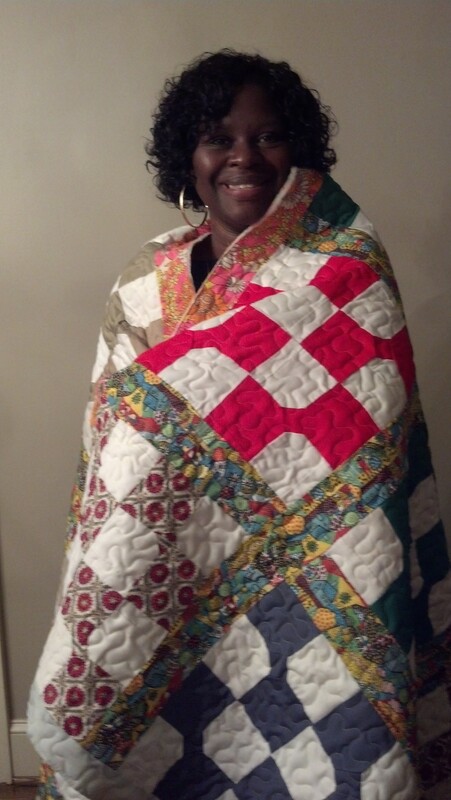 My friend and fellow quilt guild member, Yolanda, has a long time friend, Sophia. 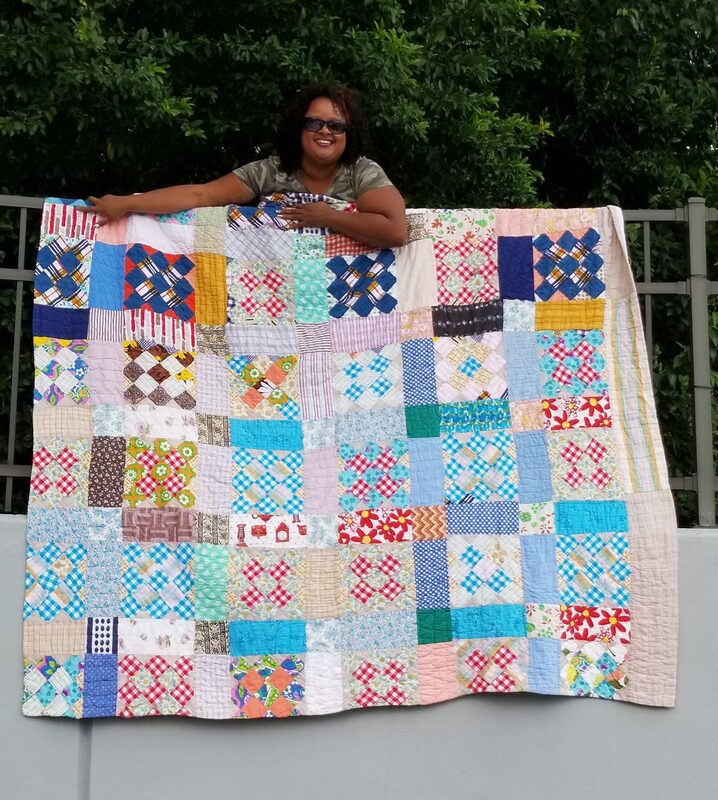 This is the story of Sophia’s family quilt and Yolanda’s remake in the spirit of the original design. My part was quilting the remake. Sophia writes “My great-grandmother, Serena Herndon (Richards), started this quilt in Oklahoma in the late 1920’s, but my grandmother, Elzira Scoggins (Herndon), finished the quilt top in Mt. Shasta and Oroville, California sometime during 1930s-1940s. My mother, Serena, born in 1945, quilted this blanket in Oroville around mid to late 50’s.” Be sure to click on the photograph to zoom in. Many of the fabrics are wildly colorful. 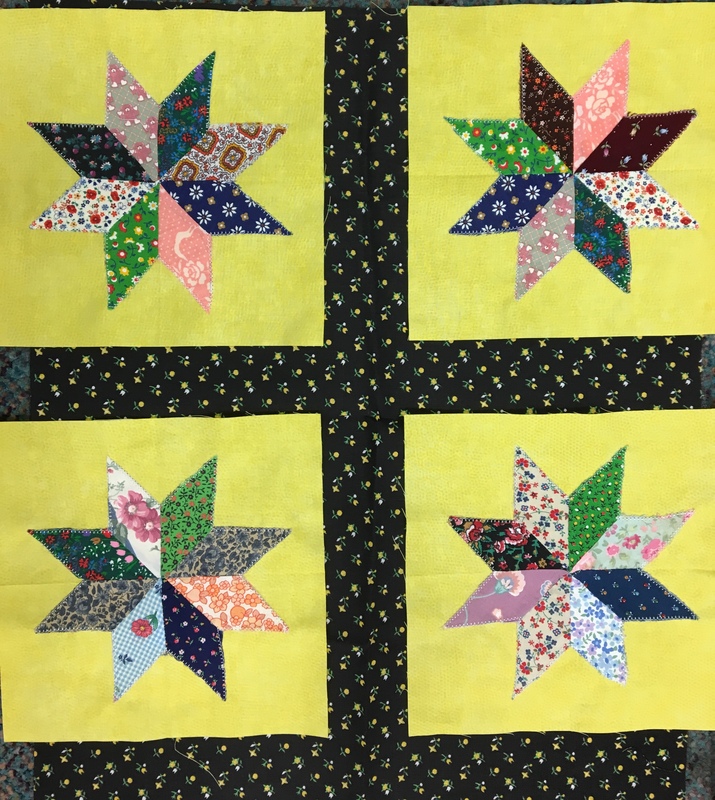 Sophia’s mother recently passed, and so she asked if Yolanda would cut up the quilt top to incorporate some of the original blocks into a new quilt because many of the fabrics were worn out from age and use. 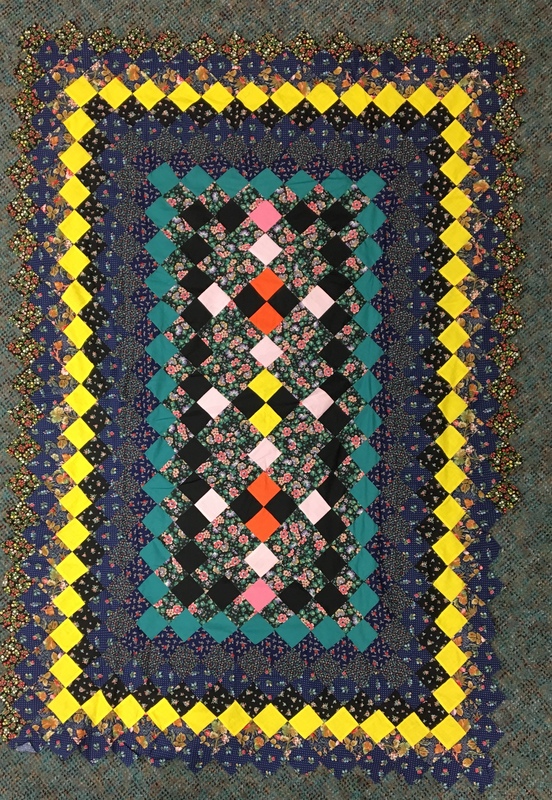 Yolanda encouraged Sophia to allow her repair the old quilt instead and also to make a new one that would capture the design of the original. Happily, Sophia agreed. The inspiration for the quilt blocks came from the original quilt. Yolanda’s goal was to isolate the original block design and set it on point. However when she laid out the blocks to audition them before sewing sashing between them, she liked the look of a horizontal set best. By exercising creative license, Yolanda gave the new quilt its own identity. The angels in the central panel are representative of Sophia and her mother meeting again in heaven. The wording “To God be the glory, until we meet again” is her way of rejoicing for the coming reunion. Yolanda selected 2 1/2 inch wide strip packs of Civil War reproduction fabrics from Connecting Threads. The border is an end of bolt find from Pineapple fabrics; the backing is 108 inch wide cotton backing also from Pineapple fabrics. I quilted the “Splash” pantograph with old gold polyester thread. 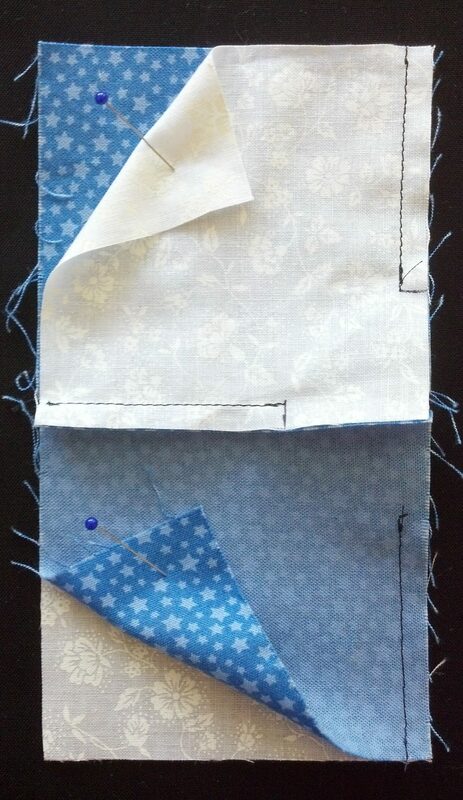 The gold blended well with all the patchwork blocks yet showed up nicely in the wide blue border. Since I didn’t want to quilt the panto over the angels, I meandered in the background of the panel and echo stitched around the angels. (It was not easy to interrupt the pantograph in this way, but this treatment suited the quilt.) Yolanda added a label which details the tale of these two wonderful quilts. In the words of Hattie, another of Yolanda’s friends, this Granny Square block is so reminiscent of lessons learned from those who have gone before us. Yolanda’s remake of Sophia’s family quilt is a beautiful story of a shared love for this ageless art work. Isn’t it wonderful how the past can bring out the best in us? My friend, Jenn, procured 30 “Little Dutch Girls” blocks hand stitched by her paternal grandmother, Leoma. We estimate that the blocks were made in the 40s or 50s. Look closely and you will see several distinctive design elements. Note that the blanket stitches are a long stitch alternating with a short stitch. Also note that the girls have two arms (or an arm and a hand); most Dutch Girl patterns that I’ve seen show only one arm. In addition, Grandma Leoma positioned the arm shoulder height toward the edge of the dress rather than in the center of the dress as most patterns of the era do. To “share the wealth” among family members, Jenn decided to split the blocks into three projects. Her mother sewed pillows of one Dutch Girl each for Jenn’s siblings, I made a wall quilt with four of the blocks for Jenn’s mother and father, and Jenn designed a quilt using the remaining 20 blocks. Although Jenn likes to decorate with muted, earthy tones, we had to choose sashing fabric that would coordinate with the primary tones of the Dutch Girl bonnets and dresses. Most Dutch Girl quilts of the 40s and 50s were sashed with solid colored fabrics; we followed suit with a turquoise/teal and rich brown. Here’s a photo showing the steps used to make the sashing pieces. For the outer border and star centers, we found a dainty print in Edita Sytar’s “Color Daze” line that paired the turquoise with the brown. Since hubby set up my long arm machine last weekend, I’ll soon be quilting “Little Dutch Girls.” I plan to use tan thread and an edge to edge clamshell design. Jenn is excited to see the project begun so many years ago completed. The quilt is doubly precious because Grandma Leoma passed away at the age of thirty when Jenn’s father was eight. I feel blessed to have a hand in making an heirloom quilt for Jenn’s family. Cindy, a friend of a friend, asked if I would finish a “Jacks on Six” quilt top her mother pieced years ago. She found the top while looking through some dresser drawers and thought it would be a wonderful gift for her soon expected granddaughter. I agreed to finish this family treasure for the next generation’s use and enjoyment. As with most vintage quilt tops, this one did not lie flat when spread out on the floor. My usual solution is to use a high loft batting manufactured by Fairfield. But I wanted to give the quilt weight as well as pouf, so I used Hobbs 80% cotton/20% polyester AND Fairfield low loft polyester batting. The poly batting and simple meandering quilting in the quilt’s interior helped to ease in fullness. I used off-white thread because most quilts made in the 70s were quilted with white thread. A curling vine adds interest in the narrow white border. Working with this quilt caused me to compare the “rules” we quiltmakers follow today with the quiltmaking conventions of the 70s. Rule #1 – Thou shalt make quilts with 100% quilting cotton. Haven’t you heard this rule preached ad infinitum? The reason behind the rule is that using the same fibers throughout the quilt will ensure that it goes together without puckers resulting from uneven stretching and that the quilt will wear evenly over time. In contrast, besides quilt-weight cottons, Cindy’s quilt contains kettle cloth, seersucker, cotton/poly blends, and light weight canvas for home decorating. Rule #2 – Thou shalt buy thy fabric at quilt shops for they shall surely offer quality merchandise. We love all the cotton manufactured especially for us quilters! And we patronize local quilt shops to purchase the solids, tone-on-tones, geometric prints, florals, stripes, and plaids. Contrast our current practice with the idea of making quilts with scraps left over from garment and home decorating projects. I don’t know about you, but I rarely make clothing; it’s less expensive nowadays to buy readymade clothing. And it’s generally less expensive to buy readymade curtains and pillows. But 40 years ago this was not the case. Many homemakers made clothing for themselves and their families as well as curtains and pillows for decorating. And thrifty ladies used the scraps to make quilts. Rule #2a – Thou shalt surely not re-purpose bed sheets for thy quilt. Many bed sheets are woven with a higher thread count than quilting cotton, offering resistance to the needle which might translate into skipped stitches when machine quilting. Contrast this rule with a current trend among some quilters to use vintage sheets, softened with years of use, as quilt backings. You can appreciate the available source of white fabric found on the edges of a sheet too worn in the center for bed use. Cindy’s mother used white sheeting as a narrow border around the quilt. 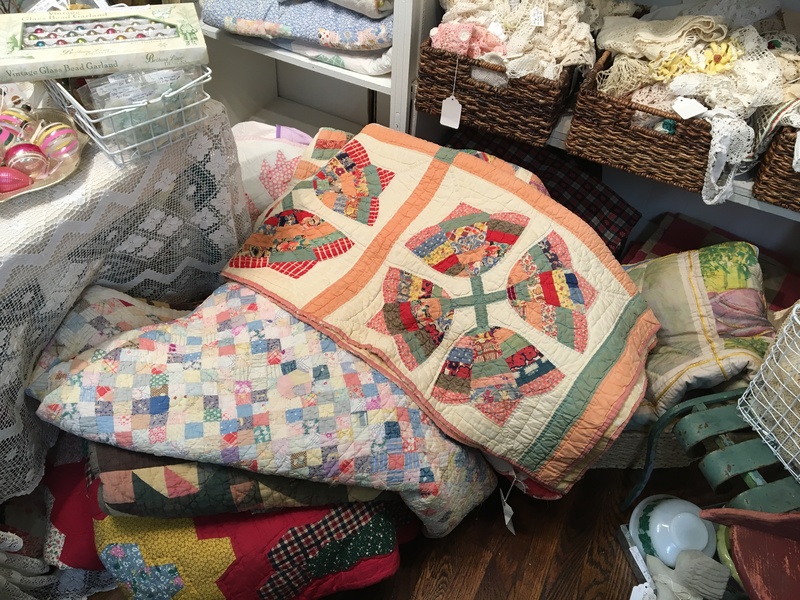 Rule #3 – Thy scrap quilts shall look color coordinated. Nowadays fabric companies require designers to design 10-20 prints and tone-on-tones that would coordinate well in a “planned scrappy” quilt. Compare this marketing trend with the earlier practice of “everything goes” in a scrap quilt. Orange, red, and pink set side by side; large scale prints, ginghams, stripes; no matter the style, all can go in the same quilt. Rule #4 – Thou shalt cut thy pieces accurately. Rotary cutters and rulers help us with this task. Consider the simple tools quiltmakers used prior to the invention of the rotary cutter: scissors, light weight cardboard for templates, and marking pencils for tracing around the templates. Most quiltmakers today aim for precision in cutting whereas many quilters in past generations, who did the best they could with what they had, counted on copious hand quilting to compensate for piecing anomalies. Rule #5 – Thou shalt piece efficiently. Today’s quilt designers study quilt block designs, asking, “Could this block be made a simpler way?” Take a close look at this “Jacks on Six” block. Notice that the block is made entirely of half square triangles. I would have substituted squares for 3 of the HST units. However, using triangles allows for an interesting mitered effect when using stripes as you can see in the photo below. 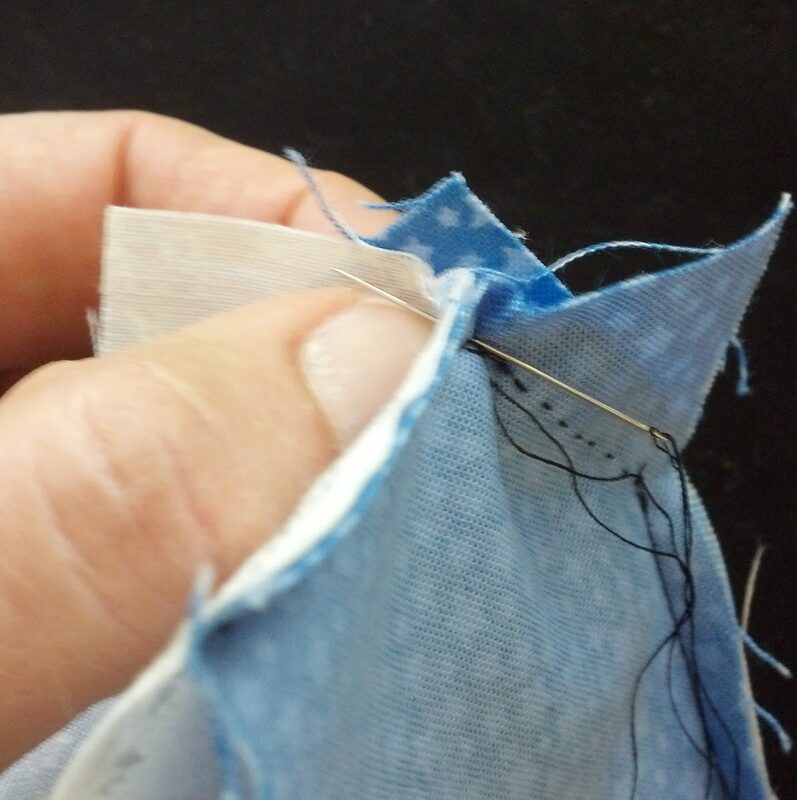 Rule #6 – Thou shalt sew consistent scant ¼” seam allowances. This is the biggie, the most important rule most quilt instructors harp on! Upon inspecting the back of this quilt, I discovered that the seam allowances varied from 1/16” to 3/8” in width. 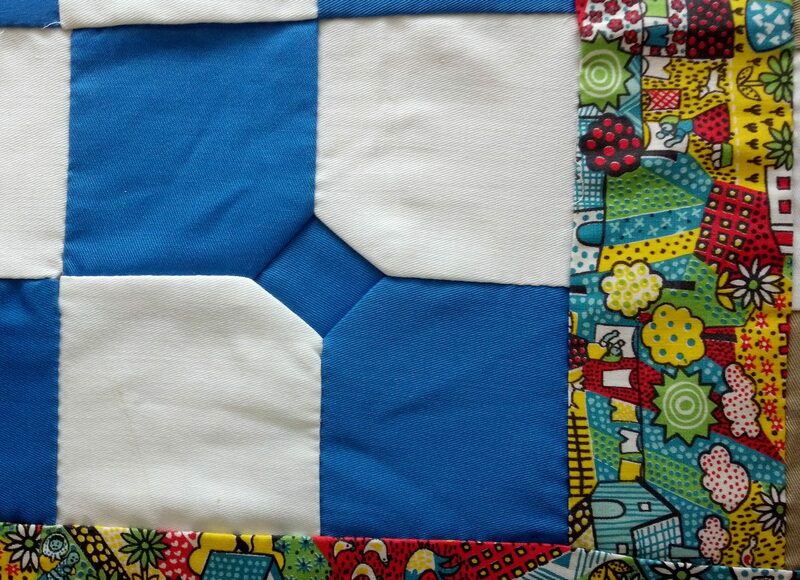 This inconsistency caused the blocks and the quilt to bubble (not lie flat). Rule #7 – Thou shalt use neutral thread. Most quiltmakers these days piece with off-white, tan, light gray or pale yellow, feeling these neutral colors will blend with most of the fabrics in their quilts. Contrast this with quiltmakers in the past who sewed with whatever thread was currently on the machine or on the bobbin, leftover from a home sewing project. Rule #8 – Thou shalt measure and trim block units prior to constructing the blocks. It’s always a great idea to compare the actual measurement of the sewn block units with the measurement given in the instructions. If your units aren’t the correct size, either adjust the seam allowance by re-sewing or trim the units to the correct size. The “Jacks on Six” blocks would have gone together more accurately if all the HSTs had been trimmed to the same measurement prior to assembling the blocks. Rule #9 – Thou shalt measure and trim thy blocks prior to sewing them into the rows of thy quilt. Despite our best efforts, quilt blocks don’t always turn out to be the correct size. Because fabrics are a bit stretchy and we aren’t robot seamstresses, we need to measure and trim all the blocks to the same size prior to assembling the quilt top. This is particularly important when making a sampler quilt. Following this rule is your quilt’s best chance of lying flat. Rule #10 – Thou shalt measure thy quilt through the center to obtain the correct measurement for thy border strips. Following this rule avoids the wavy border syndrome. Although Cindy’s mother did not follow all the current “rules” 21st century quilters espouse, her quilt has one benefit ours generally don’t. Memories. Cindy said she took a trip down Memory Lane when she lifted the quilt top from the dresser drawer and unfolded it. The fabrics in the quilt recalled images of kitchen curtains, new school dresses, and her mother’s aprons. The memories prompted by fabric are certainly a benefit of an “everything goes” scrap quilt. These types of memories can’t be emulated by purchasing coordinated fabric from one line. No matter the broken rules for cutting and piecing, this is a quilt of enduring memories, truly a treasure for Cindy’s family. All three quilts were pieced by hand and included home decorator fabrics, cotton/poly blends, and twill as well as 100% cotton. 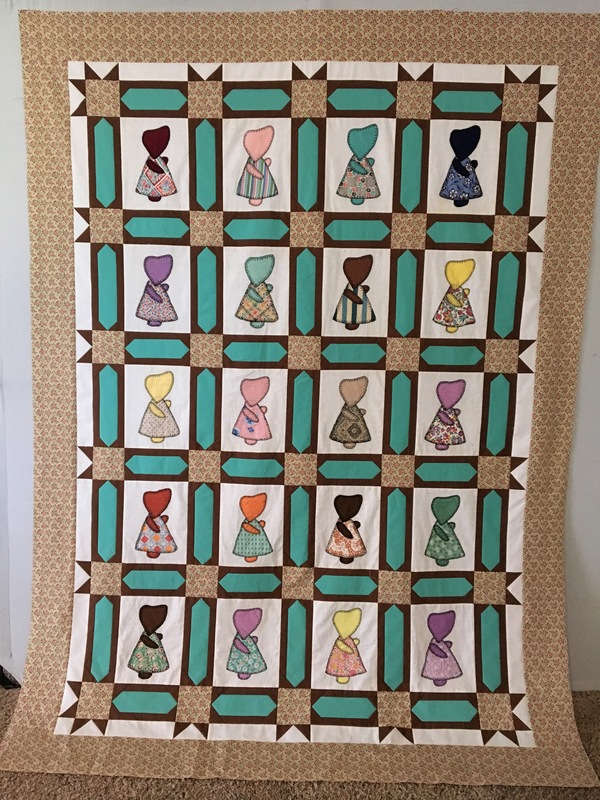 When I asked Sharon to select the quilt she most wanted finished, she chose the “Bowtie” twin size quilt because she remembered her mother mentioning it. Most of the white and all of the solid fabrics are twill (like khaki pants or school uniforms are made of). 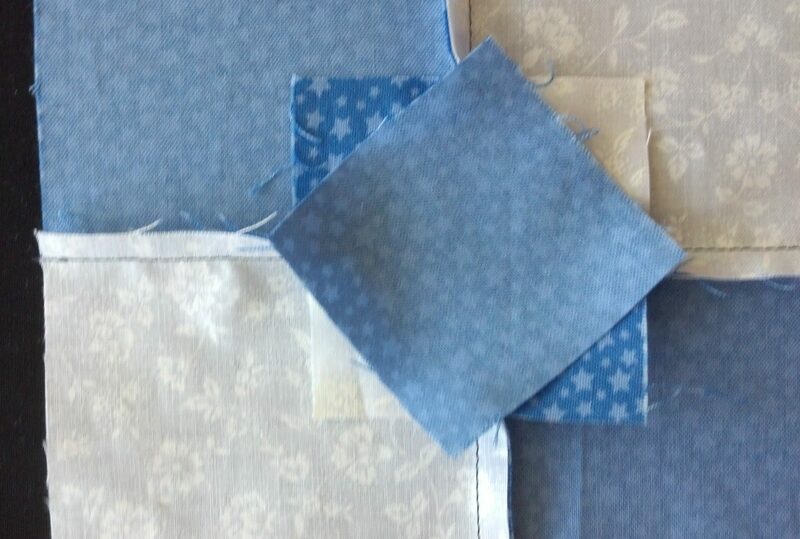 Many of the squares were pieced together prior to constructing the “Bowties.” Grandma Flora used what she had! The print sashing fabric is charming; notice that two colorways of the print are used. There’s a farmer and his wife holding a baby, a cat on the roof, a goose girl, chickens, and a woman hanging laundry on the line while a dog looks on. The bright colors of the sashing influenced my selection of the bright print backing fabric. Although I generally use a predominantly cotton batting, in this case I chose a high loft polyester batting manufactured by Fairfield because I observed that the quilt was irregular and did not press flat. Polyester (and wool) allow the uneven places of a quilt top to puff up, making the fullness less noticeable. A pale yellow thread blends well with the bold colors and is nearly invisible on the white background. By using a simple meandering quilt design, I was able to work in most of the fullness. Interesting Construction Technique: Sharon’s grandmother constructed the “Bowties” with a technique I have not seen before. Normally when we observe bowties like this, we assume the small center square has been set in, stitched to the 4 larger pentagons. Take a look at the back of the block. 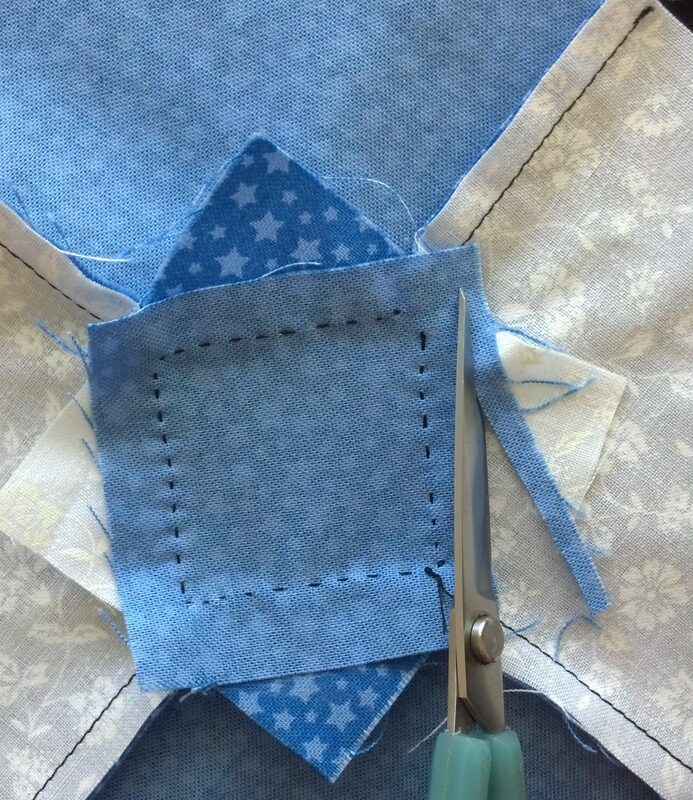 Instead of cutting out 4 pentagons (2 blue and 2 white), Grandma Flora simply cut out 4 (large) squares. I replicated Grandma’s method for you, and snapped pictures as I went along. Beginning with two white 3 1/2″ squares and two blue print 3 1/2″ squares, I marked the white squares 1 1/4″ from the corners that will end up being in the center of the “bowtie.” I machine stitched from the edges of the squares toward the center of the “bowtie” and back-stitched at the marks. 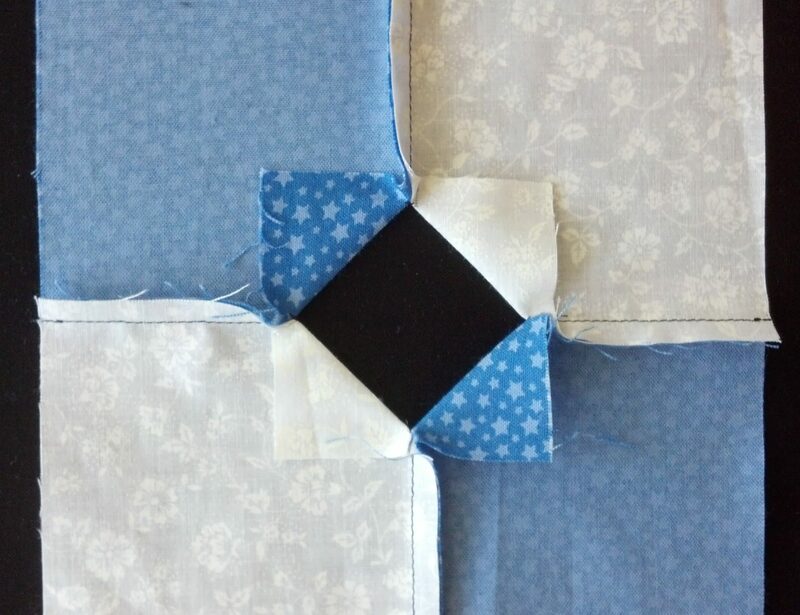 The four 3 1/2″ large squares form a “Four Patch” with a hole in the center. I folded and pressed the unsewn triangular flaps toward the back of the block. 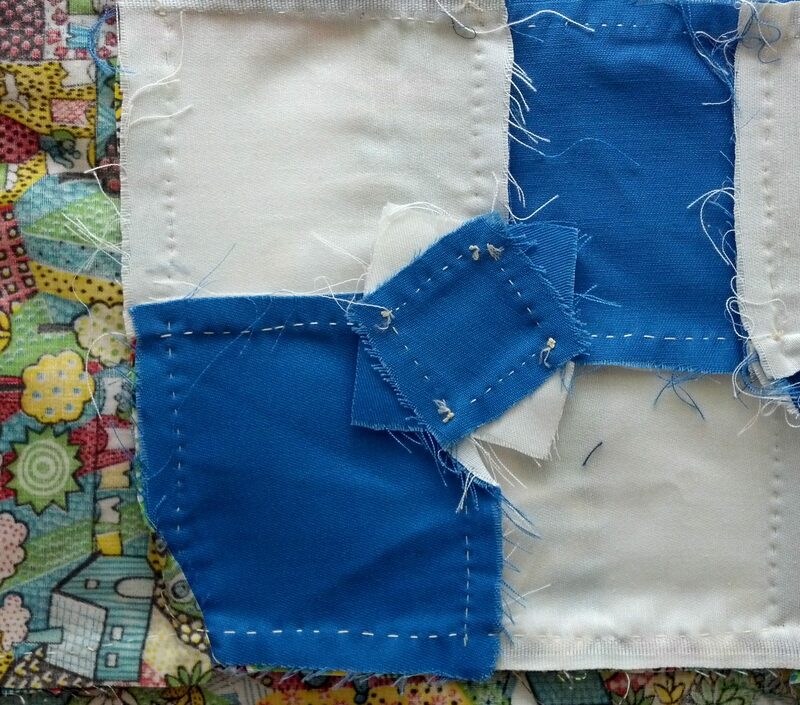 The next step is securing a 2 1/4″ square of blue fabric on top of the triangular flaps on the back of the block so that the right side of the blue fabric shows on the front of the block. 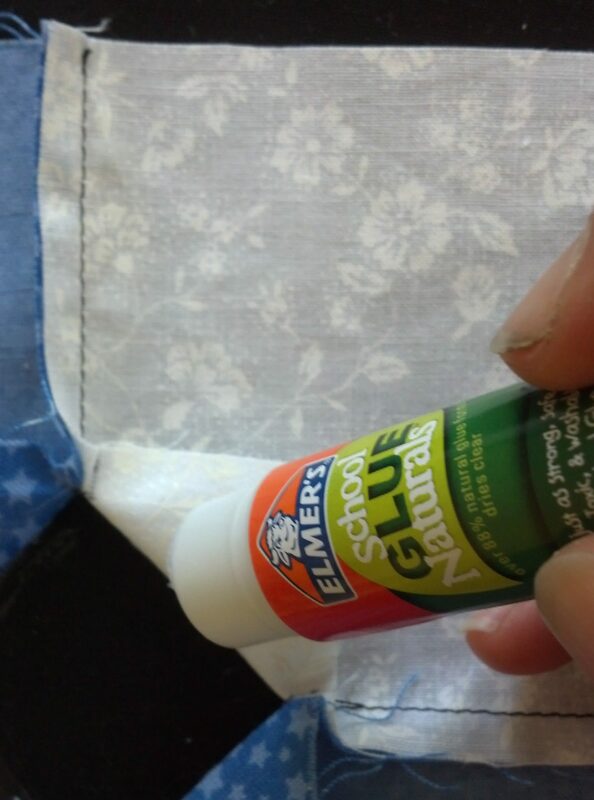 Since pins proved difficult to use, I applied washable school glue on the folded flaps. Then the flaps could be easily lifted upward as I hand stitched on the pressed fold line all around the small square. I share this technique, similar to “reverse applique,” with the thought that in the future we may see an application for using this idea in quilts we are working on. It’s always nice to know several construction methods for patchwork designs. If this method intrigues you, I recommend “Piec-lique: Curves the New Way” by Sharon Schamber. 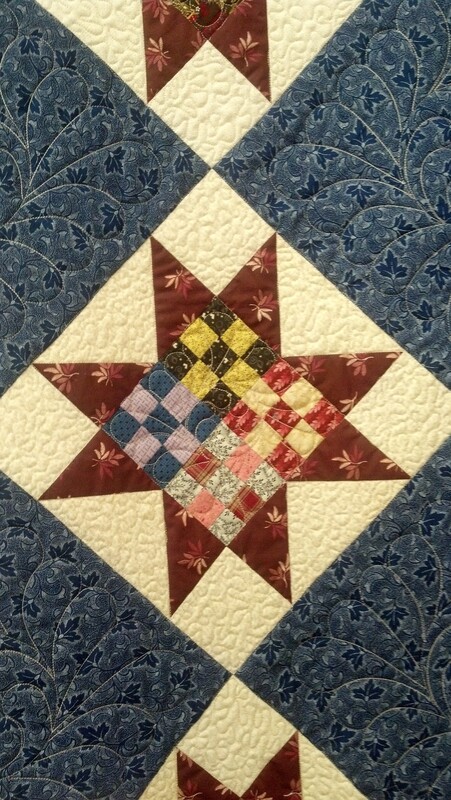 Do you own a vintage quilt top that needs completing? What is its approximate age? What “problems” do you need to overcome in order to finish it? Have you been to Nashville . . . Indiana? It is a weekend destination for Indianapolis area citizens who love gift shops packed with both country crafts and upscale merchandise. Additionally, there’s homemade ice cream, pioneer history and crafts, and nice eateries in rustic buildings. 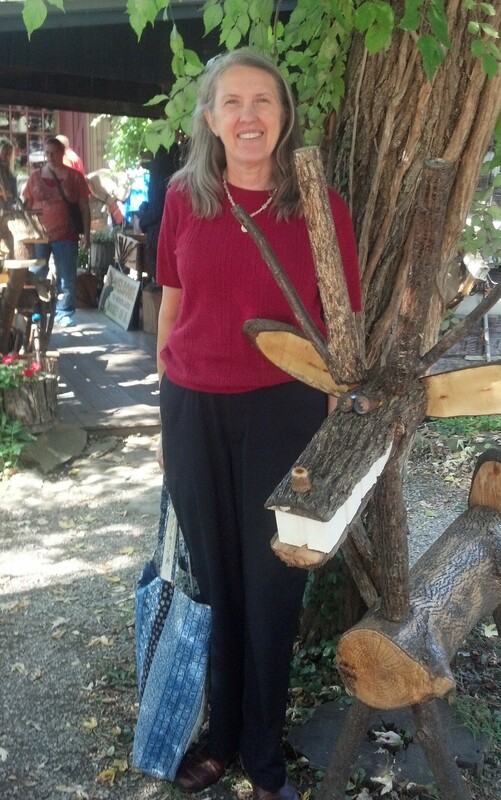 On Saturday my friend, Julia, drove me to Nashville to join the throngs enjoying fall foliage and shops AND the Brown County Historical Society’s 36th Annual Quilt Show. 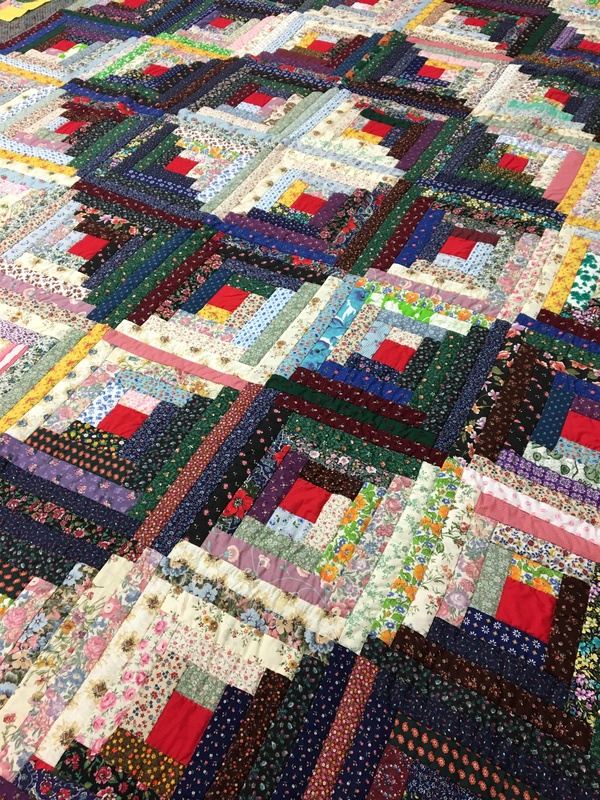 I snapped several photos of antique quilts which are always an inspiration. Over 100 quilts were in the judged portion of the show – some simple, and some complex. We both enjoyed the colorful display and variety of designs. The Bargello, “Michael’s Gift” by Kenneth Ramsey was awarded Judge’s Choice. “El’s Kitchen” by Donna McElwain took Best of Show and Best Machine Quilting and Best in the Mixed Technique category. 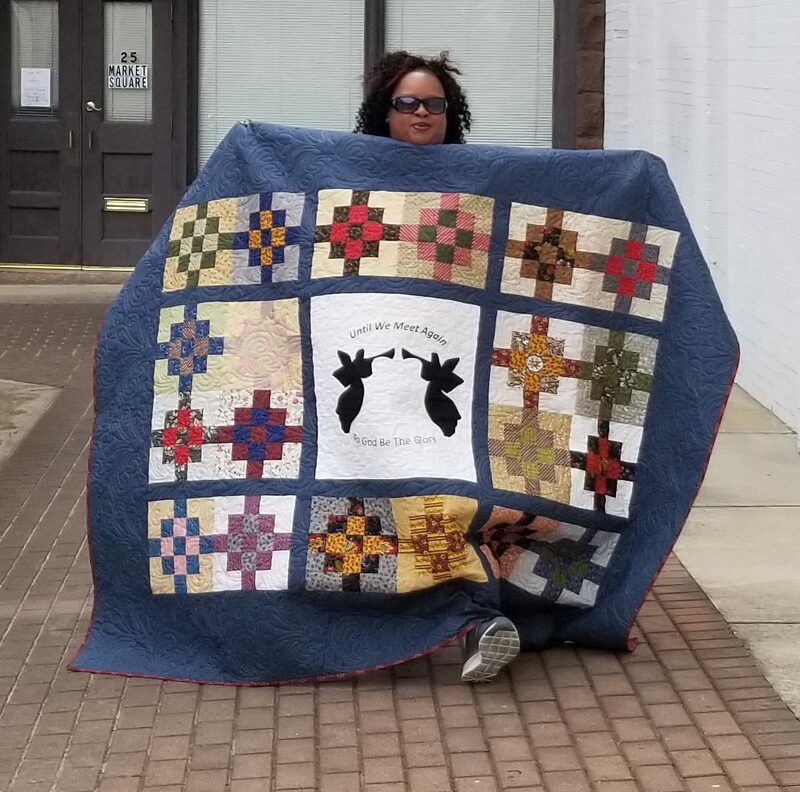 And speaking of being inspired at quilt shows, if you live near Sanford, NC consider attending the Heart and Hands Show at the Dennis A. Wicker Civic Center. Dates and times: Friday, Oct. 16, 10 a.m. to 5 p.m. Saturday, Oct. 17, 10 a.m. to 4 p.m. Will you be there? I hope to attend Friday morning.